This was the first PDP-11 system I acquired. I bought this nice little Q-bus system from a local fellow who bought it new for his business in 1979. He had been retired for a number of years and had kept his system in his garage. He finally decided to free up the garage space and get rid of his system. This PDP-11/03T system came with two RL01 drives, an RX01 tabletop floppy unit, an LA120 DECWriter III terminal, a VT100 terminal, several boxes of documentation, several RL01 packs with RT11, TSX, DIBOL, and other stuff, including some good games such as DUNGEON. The 11/03 CPU had been upgraded to an 11/23 CPU. One of the RL01 drives has a problem. I moved the good RL01 drive and the RX01 unit to the 11/40 system. 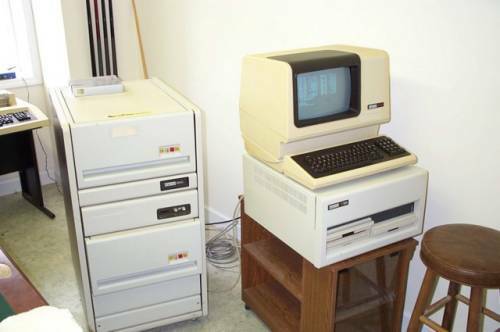 In March 2005, I sold this system to another collector who was wanting to get started with a vintage PDP-11 system. I replaced the RL01 drive bays with RL02 drives. So long, 11/03!